Jim's Mobile, Inc. is a well regarded manufacturer of astronomical telescopes and after-market accessories for the amateur and professional based in Lakewood Colorado. Jim Burr the founder and President of JMI had developed an interest in the hobby of astronomy as a small boy. He owned a small business "Jim's Mobile Color TV Shop" started in the fall of 1970 using a converted mail truck operating as a mobile shop. 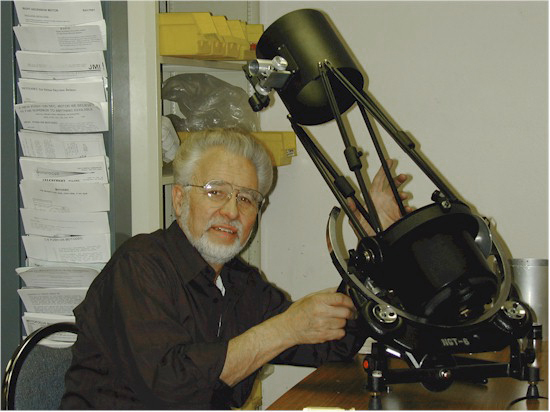 By the spring of 1983 he realized that the poor engineering of telescope mounts sold then by Celestron International, and to a lesser degree Meade Instruments opened a door to an opportunity. He developed the first MOTOFOCUS, a motor with plastic hardware that slips over the focus control knob of a telescope. The MOTOFOCUS is controlled by a hand held push button control which housed a 9 volt battery. MOTOFOCUS allows one to turn the focus control of a telescope without having to touch the telescope thereby creating vibrations. His device worked so well that he decided to advertise the product in "Sky & Telescope" magazine and began selling directly to the consumer. Right: Jim Burr with engineering model of the NGT telescope (70,983 bytes). Jim did not initially expect to develop an entirely new company from this invention, but the response to the MOTOFOCUS was so favorable that he ended up turning his hobby into a full time business. In 1986 the sixteen year old TV repair business was sold. By 1988 Jim's Mobile Industries hired its first employee. Later versions of the MOTOFOCUS hand held controls incorporated variable speed controls and these could be used to control other motorized devices. In time provisions were made by some manufacturers so that JMI focusing and declination control accessories could be attached onto their telescopes and controlled directly from the telescope control system. JMI introduced MOTOTRAK drive correctors to control AC motor driven telescopes; these provide advanced control capabilities necessary to accomplish astrophotography and allow operation in the field from 12 volt DC power sources. For a time JMI was making the motorized focus and declination control add ons for companies including Celestron; these were marketed as a Celestron product but were identical to the JMI labeled items - that was until some bean counter at Celestron decided to have the components cloned overseas and bypass JMI. But this good start over the Comet Halley years empowered JMI to grow and develop other new products including telescope focusers of the NGF series. In time, JMI developed and marketed their own series of telescopes the "New Generation Telescope"; in early 1990 the first of their NGT-18 telescope was sold. The business was incorporated in 1991 under the name Jim's Mobile Incorporated. By the fall of 1991 JMI celebrated the sale of their 50th NGT. During the ten years from 1993 to 2003, the JMI office and manufacturing spaces grew to five times its original size. In February 2005 JMI finally incorporated all their operations into one larger building. A number of true innovations followed including the 2003 introduction of the awesome visual RB-66 Reverse Binocular Telescope. By 2004 this was followed by the RB-10 a 10 inch model, and for the Summer of 2005 a new 16 inch model! Thanks to their reputation for quality and the resulting customer loyalty, the company has continued to grow every year since its inception. JMI has earned its place as a respected manufacturer of innovative amateur astronomical equipment worldwide. The JMI company was among the first to offer a series of computerized add ons for telescopes mounts which would help the user of the telescope navigate their way across the night sky. The electronic CPU's are basically made by one or two specialty houses, but the JMI firm stood out by developing the hardware needed to attach the encoders onto many makes and models of telescopes. These became such an important part of the product line that we have an overview of the MAX systems on line. These "Digital Setting Circle" offer a variety of features dictated by the sophistication of the CPU. These digital systems are not "Go To" systems as many telescopes today are. These systems require that either the telescope be manually moved across the sky, or that an independent drive system move the telescope across the sky. Digital Setting Circle systems do not on their own make a telescope move in any direction to any position such as "Closed Loop Computer Controlled" Systems may do. Each of these systems are essentially three components a "Central Processing Unit" (CPU) computer, two encoders, and the mechanical hardware necessary to attach the encoder to a telescope mount. When in the field, one will start by initializing the CPU so that it understands "where it is" relative to the sky. Then a CPU will by computing the relative motions of the telescope mount based on information provided to the CPU by the two encoders, the CPU will up date the display to reflect where the telescope mount is pointed to. Encoders and associated mounting hardware "kits" are available for most popular telescopes; such kits are not so easily interchangeable from one mount to another to justify the effort. However, the CPU can easily be disconnected for use as a portable data base. Or the CPU may be moved from one telescope to another, even if the encoders differ from one telescope to another since the CPU settings can be changed easily to permit the use of that CPU.